Today’s Sai Shradha Moorti Arts bring to come marble handicraft items which is form of marble and give exclusive look for your dream home…..
We at "S.S Moorti Arts Home Decor Products" manufacture premium quality of marble handicrafts, marble statues for home decoration purpose. 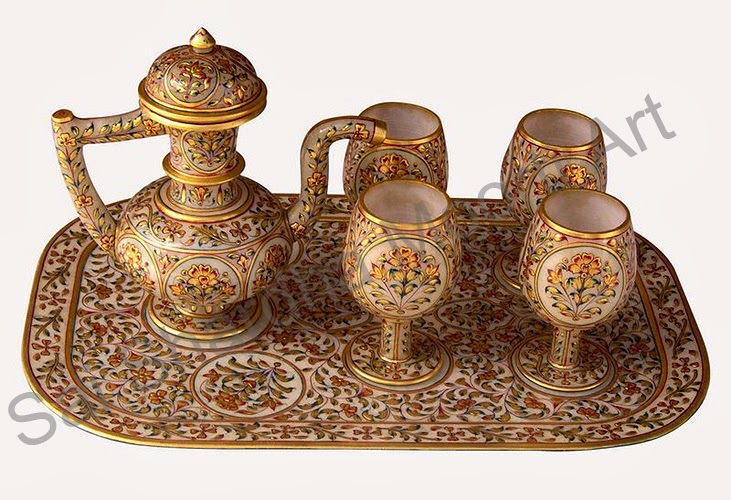 Our complete collection of unique marble gifts, home decorations are presented in this section by Marble Decor type. These unique marble gift items include Antique Marble Watch, Elephant Pair, Marble Gold Painted Hookah, Marble Jam Set, Marble Painting, Mable Painting Ganesha, Marble Plats, Sai Baba Statues. Many of our hand designed marble gift items and attractive accessories are specifically designed, provided for sale in several sizes and a variety of unique rock types. Some of the essential things that people want in their dream homes are beautiful interiors, attractive exteriors, eye catchy kitchen, and a luxury bathroom. Almost everyone wants the best landscaping in his or her garden and a comfortable arrangement to sit there with pride in heart and peace in mind. People are often obsessed with massive homes shown in films and television and they want their dream home to reflect the same brilliance. Sai Shradha Moorti Manufacturer and wholesale suppliers to the marble statues and decorative accessory industry. We are committed to offering exceptional pieces that will exceed your expectations, to provide outstanding customer service and to ship orders promptly. Many of our genuine Marble Statues and Decorative Items are exclusively designed by our artists and available for sale in several sizes. Please don't think twice to contact us if you have any issues or would like more information. © Copyright 2011, Reserved By Saishradhamoortiart. Simple theme. Powered by Blogger.